I’ve dubbed my invention a caprese all’americana, or American-style, in honor of the upcoming Independence Day holiday here in the US. It’s a dish that meets all my criteria for a perfect summer dish: colorful, tasty and really quick to make. It would make a great starter before digging into beautiful platter of grilled meats. That’s my idea of a great 4th of July cookout. Dress the arugula lightly with olive and salt, then lay down a bed of arugula in individual plates. Slice each mozzarella and lay it out in an attractive pattern on each plate. Now mix the corn kernels with the diced tomato and sliced green onions. Dress the mixture with olive oil, followed by the lemon juice, then season generously to taste. If you like, mix in a few shredded basil or mint leaves just before serving. Spoon the corn and tomato mixture over the mozzarella in an attractive pattern, for example, piling it high in the middle of the plate and sprinkling a bit around the sides as well. Drizzle a bit more olive oil over everything and serve. There’s not much fuss involved in this dish, but as usual the quality ingredients will decide the quality of the final dish. I wouldn’t insist on mozzarella di bufala for this dish—a good quality domestic mozzarella will do fine, but do look for fresh mozzarella, the kind that you buy packed in its whey. The kind of cheese that is sold as mozzarella dry and wrapped in plastic is OK for cooking but not very appetizing eaten raw like this. But if that’s all you can find, then try this little trick: let the cheese ‘brine’ in lightly salted mixture of half milk and half water, enough to cover, for an hour or two. That will soften the cheese and add a bit of savor. 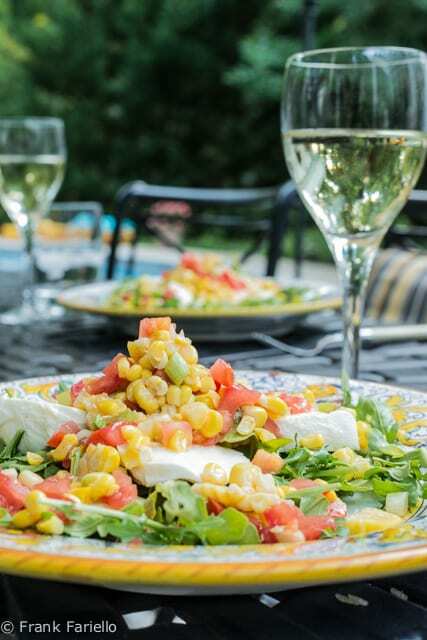 A classic Caprese Salad contains no vinegar or lemon juice, but for this American style version, I’ve added just a bit of lemon, enough to offset the sweetness of the corn and brighten the dish. But be very discrete about it. There should be no discernible sour taste at all. Look so delicious and so healthy! I’ll surely try this at home.. I thought corn was to make popcorn (Something Americans eat at the cinema) Bo? I have to say, I’m always surprised to see corn in lots of salads when I travel to Italy. Over there, it’s a turn off, even though the other ingredients (tomatoes, mozzarella) are high quality. Here, we we have great corn, it makes some sense. I’ll have to push aside my “purist” tendencies with this classic, and try it with corn. Happy 4th! Thanks, Linda! Hope you had a great holiday. Yes, I remember well Italians’ corn-phobia from my years of living there, and I was reminded of it by some of the comments on this post—which turned out to be one of the more “controversial” I’ve written in a while. In my experience, though, once people get over their prejudice and try good, fresh corn, they usually like it. I can remember making corn chowder one time for a group of skeptical Italian friends. It turned out to be a big hit. Grazie, Chiara! Buona settimana anche a te. I am anxiously waiting for our local sweet corn to arrive at the market. I like the title you chose for your fusion salad. This would be even better with farm-fresh corn… ! This is a great idea for the summer, looks wonderful Frank! There’s nothing wrong with twisting up a recipe! This is one beautiful summer salad!